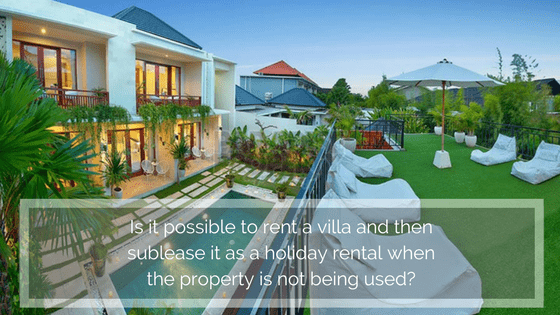 We often receive the question, ”Is it possible to rent a villa and then sublease it as a holiday rental when the property is not being used”? The issue on subleasing is quite controversial. Some claim that the procedure can be legitimately done by tenants. Others oppose this assumption and allow the sharing of leased and subleased properties, hence violating the terms of the rental agreement. Some people think subleasing is okay because the first tenant has the power to freely use the unit he has leased. Of course the tenant assumes that this includes subleasing b some or all of his rented property to gain a return. Whereas if referring to the Civil Law (KUHPerdata), subleasing can be categorized as unlawful. Article 1559 of the Civil Law states that tenants are not allowed and should not abuse their leased goods or release their leases to others. The prohibition of re-leasing a leased unit is also contained in Government Regulation No. 44/1994. The rule is clearly stated, "The renters are in any way prohibited from subleasing and / or transferring the occupancy rights of their rented house to a third party without the written permission of the owner." Subleasing is common and widely accepted in Bali property but as mentioned before, it must be done with the full knowledge of the landlord. As long as it is stated in the contract between the landlord and the tenant that the property can be subleased or that the tenant gets written permission from the landlord to sublease, then it is allowed. Before subleasing your rented property, you must also understand that you have to make a sublease contract agreement between you and the subtenant. The original contract between you as the original tenant and the landlord is still valid. For those who want to sublease a property, we advise that you clearly understand in advance the relevant rental regulations. This is to avoid any illegal ramifications between you and the property owner or with the authorities in the future and one should think twice before subleasing without the proper licensing or agreement. Indeed there are still some tenants who secretly sublease their properties without prior consent from their landlord, resulting in additional tenants, animals or noisy and unruly occupants in the property. This ‘secret’ practice should not be implemented because it can cause problems in the future. Lastly, If you are planning to open a guesthouse or rent a villa to tourists in a legal way, you can obtain a Pondok Wisata license. A Pondok Wisata is a license which allows you to rent out a small property or homestay. As we are not qualified legal advisers, we can only provide a general information. For those wanting full legal advice, one needs to get qualified legal advice.